This year’s MIG will feature a half day Machine Learning workshop led by Daniel Holden (Ubisoft), and Jungdam Won (Seoul National University)! Both researchers have used ML to make great contributions to the field of character animation. This workshop is designed to show attendees how they can start to use ML in their own research. More info about the workshop is available here: http://cyprusconferences.org/mig2018/workshops/ . Motion plays a crucial role in interactive applications, such as VR, AR, and video games. Characters move around, objects are manipulated or move due to physical constraints, entities are animated, and the camera moves through the scene. Technological advances in VR and AR have also enabled new ways for users to interact with digital environments. Motion, Interaction, and Games (MIG) is focused on the intersection between these three complimentary research areas. Motion is currently studied in many different areas of research, including graphics and animation, game technology, robotics, simulation, computer vision, and also physics, psychology, and urban studies. Likewise, the challenges of interaction drive research in wide ranging fields from mechanical engineering, to interface design, to perception. Games provide a unique application domain for investigating the intersection of the many facets of motion, interaction, and other areas of graphics. Cross-fertilization between these communities can considerably advance the state-of-the-art in the area. 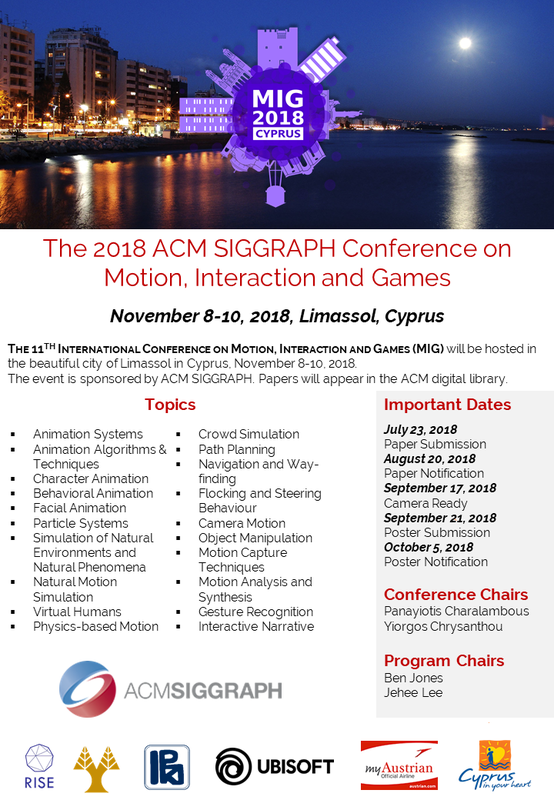 The goal of the Motion, Interaction, and Games conference is to bring together researchers from this variety of fields to present their most recent results, to initiate collaborations, and to contribute to the advancement of the research area. The conference will consist of regular paper sessions as well as presentations by a selection of internationally renowned speakers in all areas related to interactive systems and animation. The conference includes entertaining cultural and social events that foster casual and friendly interactions among the participants. All of the accepted regular papers will be archived in the Eurographics and ACM digital libraries. Authors of select top papers will be invited to submit extended and significantly revised versions to be considered for publication in a special section of the Computers & Graphics Journal. All papers will be reviewed carefully by the International Program Committee members through a double blind process, with at least four reviewers per paper. We invite submissions of original, high-quality papers in any of the topics of interest (see below). Each submission should be 7-10 pages in length for the long papers or 4-6 pages for the short papers, and will be reviewed by an international program committee for technical quality, novelty, significance, and clarity. All of the accepted regular papers will be archived in the EG and ACM digital libraries. All submissions will be considered for Best Paper Awards. Best Paper, Best Student Paper, and Best Presentation awards will be conferred during the conference. Authors of the top two papers will be invited to submit extended and significantly revised versions to be considered for publication in a special section of the Computers & Graphics Journal (5 Year Impact Factor: 1.352). Accepted papers will be presented at the conference during oral sessions. Best Paper and Best Student Paper awards will be conferred during the conference. We also invite poster submissions for work that has been published elsewhere but is of particular relevance to the MIG community(this work and the venue in which it as published should be identified in the abstract), or work that is of interest to the MIG community but is not yet mature enough to appear as a short or long paper. Papers should be formatted using the SIGGRAPH formatting guidelines (sigconf). To submit, please follow these instructions before submitting to the easychair submission system. The goal of the Motion, Interaction and Games conference is to bring together researchers from this variety of fields to present their most recent results, to initiate collaborations, and to contribute to the establishment of the research area. The conference will consist of regular paper sessions, poster presentations, and as well as presentations by a selection of internationally renowned speakers in all areas related to interactive systems and simulation. The conference includes entertaining cultural and social events that foster casual and friendly interactions among the participants.